Israeli ground soldiers fought Hamas in Gaza Saturday night and killed more than 30 terrorists. Israeli ground soldiers fought Hamas in Gaza Saturday night and early Sunday morning and killed more than 30 terrorists. A Hamas mortar shell was the cause of most IDF injuries. Two soldiers were evacuated to the Soroka Medical Center in Be'er Sheva and are in serious condition. Two others were moderately wounded, and 24 more soldiers suffered light injuries, including from the extreme cold; eight of them treated in the field. In the video above released by the IDF, Israeli soldiers give messages to loved ones and to the residents of the south before entering Gaza, explaining in Hebrew that they are going in, knowing it is dangerous, in order to protect them and to put an end to the rocket fire that has endangered their lives for so long. Most of the ground soldiers are in northern Gaza, but fighting also was reported in central Gaza. Morale was reported high among the soldiers as well as among thousands of reservists who have been called to duty. The IDF thoroughly prepared Givati Brigade, Golani Brigade, engineer and tank units for the ground incursion, with the mission to stop rocket fire on southern Israel. One Kassam rocket hit a house in Sderot shortly after 8 a.m. Sunday, injuring one person lightly. Two rockets exploded in open areas in Netivot around 7:30 a.m. Six other rockets were fired on open areas in the Sderot and Eshkol regions since the ground troops crossed into Gaza around 7:00 Saturday evening, and an uncertain quiet permeated highly populated southern areas. An Israeli Air Force strike bombed the broadcast center of the Hamas-run Al Aqsa television station, according to the Arabic-language Al Jazeera network. IAF planes struck over 45 targets including tunnels, weapons storage facilities, mortar shell launching squads and a number of mortar shell launching areas. 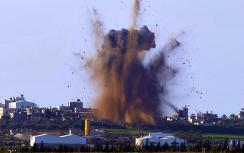 The IAF also bombed a terrorist target in Rafiah around 7:30 a.m. Monday, killing one terrorist. IDF commander of Gaza operations Yoav Galant ordered an extension of the closed military zone in the Gaza Belt area to include Ofakim and Netivot.